A proposal to break up eBay struck a chord with investors -- now the question is, who might be interested in snapping up pieces of the business? 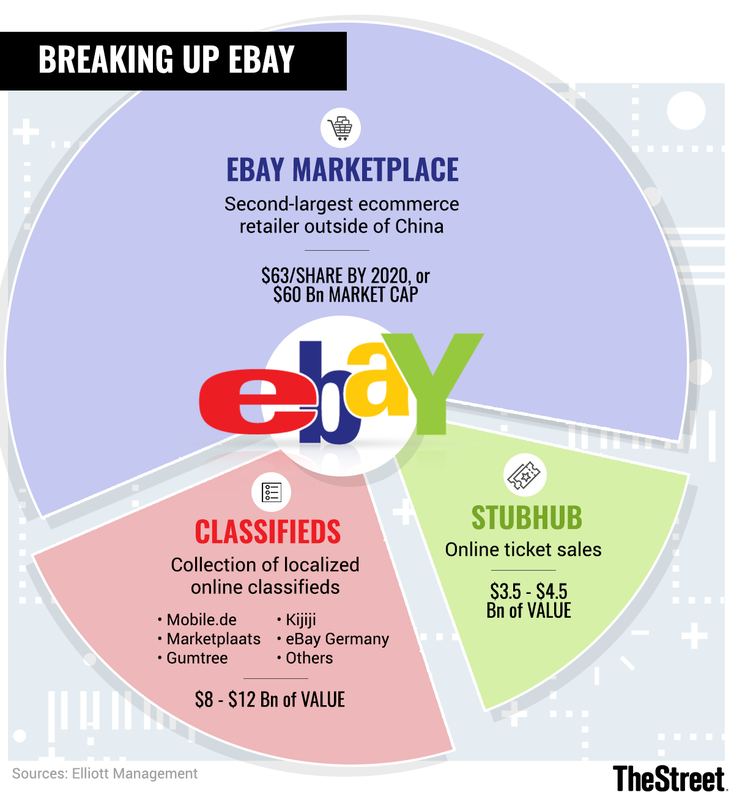 The proposal, which came courtesy of the activist investor Elliott Management, is seeking to spin out the various legs of eBay's business, which includes its main Marketplace site, online ticket seller StubHub and Classifieds. The prospective breakup of eBay's business of its business has some basis in recent history -- namely, when eBay spun off PayPal (PYPL - Get Report) in 2015, with the two operating and trading as independent companies. As DA Davison's Tom Forte pointed out, that spinoff was considered a success. "An argument could be made that it was wildly accretive for investors, so the playbook has been proven when it came to PayPal," Forte said. In a letter to eBay's management this week, Elliott urged the company to spin off two of its non-core holdings, StubHub and its Classifieds business, which is a collection of localized classifieds sites from across the world. The letter estimated the value of StubHub at $3.5 to $4.5 billion, and Classifieds at $8 to $12 billion. "It is critical to recognize that eBay's sustained underperformance is not due to a lack of potential or a poor end-market. Instead, we believe that eBay has missed a number of actionable growth opportunities while distracted by non-core endeavors," wrote Elliott Management partner Jesse Cohn. "These have been meaningful financial disappointments in their own right, but the larger cost was the diversion of attention from Marketplace." As for the Marketplace business -- eBay's core site for selling and bidding on items -- the letter lambasted eBay's wasteful operations and "misexecution" on initiatives, but argued that given improvements to the product and to how the business is run, shares could rise to $63 by 2020. Shares closed at $33.72 Friday, up 3.28%. Ebay has been trying to refocus investors on improvements to its site and growth in the payments and advertising aspects of its business, presenting a five-point plan on its October 2018 earnings call aimed at repositioning the brand and expanding its customer base. In the past 12 months, eBay's stock has sagged 18%. Although it's been significantly outperformed by competitors like Amazon (AMZN - Get Report) , eBay is still the second-largest e-commerce platform in the world outside of China -- and the letter stated emphatically that "As e-commerce penetration accelerates, it is clear that eBay's unique buyer, seller and geographic breadth make Marketplace a highly attractive acquisition target for both financial and strategic buyers." Without any operations improvements, Elliott projected it could fetch $15 billion and present an opportunity to gain an e-commerce foothold in many large markets. As for who might be interested in such an opportunity, Elliott Management believes that Alphabet (GOOGL - Get Report) , Walmart (WMT - Get Report) or various private equity firms could be game, CNBC reported, citing a source familiar with the matter. Over the years, others have speculated that Facebook (FB - Get Report) could be interested in eBay, given its own lagging Marketplace vertical and a 2017 partnership that added eBay deals to Facebook's app. Others have suggested that Alibaba (BABA - Get Report) might consider buying the site to expand its global footprint. Elliott Management didn't respond to a request for comment on prospective buyers of Marketplace. The breakup proposal could also get some new backing soon, with the activist hedge fund Starboard Value LP reportedly planning to suggest similar changes to eBay's leadership. Forte added that while the Elliott proposal resonated with many investors, the target valuations of each leg of the business may be "optimistic." "I am more optimistic about the current plan -- the ramp-up efforts on advertising and payments -- though I do acknowledge that spinning off the non-core assets could be wildly successful," Forte added.